Music lovers who especially connect John McCabe the pianist with the Classical composers, and especially with the formal grace of Haydn’s piano sonatas, may be surprised to see his name linked with the Late Romantic works of Arnold Bax. However, John had a great love for his music, over a long period of time, and his own record collection contained a very large number of CDs of Bax’s works. One of John’s earliest piano records, now issued on BMS 103CDH as ‘An English Recital’ contains the beautiful Allegretto of Bax’s Piano Sonata No. 4, as a separate item. In 1992 he recorded Bax’s magnificent Piano Sonata No. 2, together with the shorter solo work, Legend, and the original solo piano version of what became the First Symphony on a Continuum CD (CCD 1045). Both of these CDs received outstanding reviews. 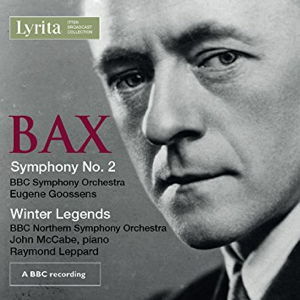 However, in 1978 John was the soloist in a BBC broadcast of Bax’s evocative work for piano and orchestra, Winter Legends, in a superb performance with the BBC Northern Symphony Orchestra (as the BBC Philharmonic was then known) under conductor Raymond Leppard. Again this artist would not immediately spring to mind in connection with the music of Bax, yet the partnership worked wonderfully well. Thanks to the devotion of Richard Itter, of Lyrita, in recording and preserving broadcasts of English music, using the best quality equipment, this performance is to be made available again, coupled with another rare reissue, that of the Second Symphony, with the BBCSO conducted by Eugene Goossens, this recording dating from 1956. The sound has been excellently restored by Nimbus, and the CD will be issued on 3rd November 2017, in the series entitled Lyrita Broadcast Edition, in collaboration with the BBC.